Scene 1: The Past. A room in Tottenham. Summer. A long, long time ago. Franz Shealey, then a lip reader is watching Phil Sherman speak. He asks; "What is your favourite story?" Fran replies' "A Christmas Carol". "Wow!!!! That's mine too", reposts Phil. Immediately, Fran and Phil; the clown and mime artist respectively behind children's theatre company Booster Cushion Theatre set about creating their own unique version of Dicken's famous tale. Scene 2: The Present. The Karamel Club, Wood Green. A family day out. My wife and I (that sounds so regal) want to introduce the Tarpey family to the club; a place that has become more and more important to us as a site for friendship, food, entertainment and exposure to the arts. I especially want to introduce, James Tarpey, a young drama student, to Phil's wild take on the story. 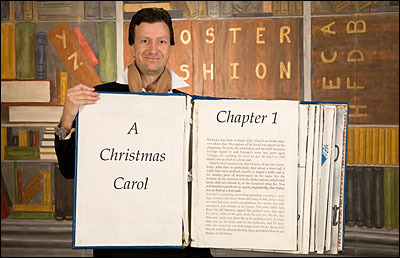 Phil offers children the chance to brag and joke with that old card Scrooge through the use of pop up books, humbugs, mime, voice and sign language. Booster strive to be inclusive to all ages. I watch the show with a smile but am more happy to note that all my guests sit wholly entranced. Scene 3: Later in what was then the future. I set up an interview between Phil and James. I had an idea about the meeting of generations akin to an old NME interview where then young mod, Paul Weller met old mod Pete Townsend. We would use quotes and titles from The Jam and The Who. I might ask James how do you think he does it and hopefully James would say more than I don't know. But it didn't work out like that. We simply explored past, present, and future. Phil was as helpful and friendly as could be. James more than held his own as you will see in a later featured interview. But first more on the Karamel Club. It's a part of the Chocolate Factory in Coburg Road, Wood Green, London, N22. Its run by Rosely Funari, Phil's wife. Rosely also acts as an ideas person and is first point of call for people wanting to book this useful space for whatever reason. Its primary function is to run as a hub for local artists and connoisseurs. Chef Ian's food makes it more than this. It is somewhere to drop in to, a place to enjoy. The walls are usually full of art to buy. A small, inaccessible stage allows for music nights and comedy nights. Booster Cushion Theatre are aiming to play there once a month to show a broad retrospective of its work. Until now the Karamel Club has been one of London's hidden treasures. Watch it take off!